We none of us are getting any younger, are we? Yesterday (Sat 16th) my next sibling down – Philip – was getting a surprise 60th birthday party from my other siblings, family and friends – which I of course was unable to attend, being 11,000 miles or so away. The Lucky One? – indulging my travel addictions! – but missing family fun. My friends Peter and Christine – with whom I am staying – live (with their 4 daughters and his mother) on the Gold Coast of Queensland, close to the “city” of Surfers Paradise. Not sure how accurate that name is these days; the entire beachfront here is lined with tower blocks of apartments, hotels and holiday rentals. Those on the second row back will be lucky if they ever see the sun at all! Queensland has always been – it seems to me – a little like Perth. Like a rather brash, unruly younger brother to its more sophisticated rellies (Sydney/Melbourne) – rather like Leicester Square next to Covent Garden. Both very popular with visitors but one slightly more garish and with its hair let down. The Gold Coast – more Las Vegas than Leamington Spa!! Brisbane itself I don’t know well, but will be investigating soon. Mine hosts kindly (and very expensively) took me out to dinner on my first night here – to a purpose built dinner theatre venue called Draculas! Think theme park crossed with Rocky Horror Show, crossed with The Trocadero and you get the picture. From the coffin room style entrance, through the Ghost Train cars which took us in pairs down the main dining area; the enormous (a litre?) goldfish bowl cocktail glasses to the serving staff impersonating Avatars, Vampires or Zombies, right through to the show itself. A combination of schlock horror / heavy metal crossed with ventriloquism, cross-dressing, puppetry and plain old rock from the 60s to the 90s which carried us along by force of enthusiasm, noise and sheer-salesmanship for 3 hours. I was exhausted, over-excited and dying to buy my own set of fangs (only $35!!) by the end of the night. On a gentler note, the BLOG is titled Derby and Joan – see above – because Joan (Peter’s mother) was quizzing me about England and places she remembered, including – as it happened – Derby. Or Durby as she called it……. One of the loveliest things about people here is that , despite a rather ambivalent past history with successive British governments, and despite enormous changes in the ethnic make up of the population (even in the 10 years or so since I was last here), so many people still have ties to the UK and Ireland and want to talk about where they or their ancestors came from. Even if they have never been to Europe and don’t plan to go anytime soon! I keep getting blamed for bringing English weather with me! Though it is winter now, here in Queensland they insist the last 2 years have seen a change in climate towards wetter, colder winters. This is the first time I have been In Australia in the “winter” and I suppose I would equate it with an English autumn; often cold and misty at night. I notice more than the locals do though, that when the sun shines, there is some heat in it – despite mid-winter – something that would not be the case in mid-December in England, even if the sun deigned to shine! 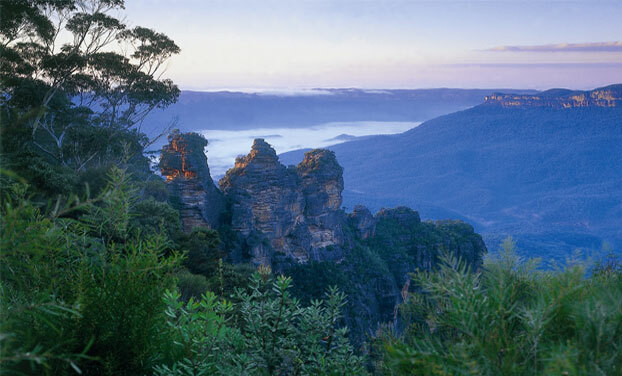 The last few weeks – though based in Sydney – have seen me making short trips away (usually with my old friend Brenda) both up and down the coast and inland to the Blue Mountains. So-called because the blue-ish green tint of the native eucalypts, especially in the evening light, gives the mountains that sort of hue. They are very beautiful – incidentally – and it’s fun to imagine the difficulty the first settlers had in getting up the hills to start with. Unlike Britain, where following a river up will usually find a path through mountains, the land here doesn’t do that and often they followed for miles only to fruitlessly arrive at a blank and towering cliff, with little hope of ascending it! Brenda lived at one time in a small town called Blackheath – around the 4000 feet mark – and there are other friends who recently moved to Richmond. Windsor is nearby, as is Pitt-town. You will note the derivation / influences of the place names! Many of the coastal areas bear a combination of Aboriginal as well as European names. A glance at the map that follows shows quite a selection – and will also give you some idea of the distances involved here. When compared to the UK, you realise what a very small – and quite crowded – country the UK is. 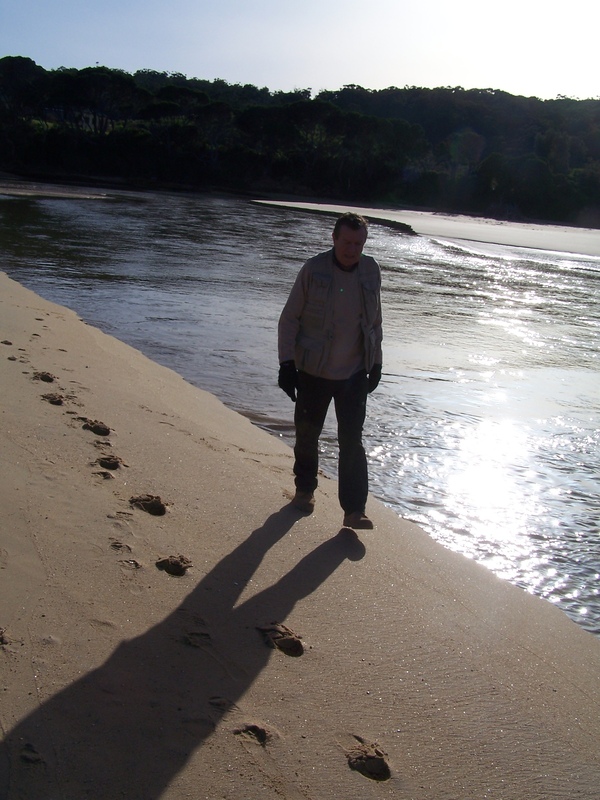 Spent a pleasant 2 days in Eden – almost as far south in New South Wales as you can go. Once a huge whaling industry was based here; now only tourist come – though they come for whale watching as numbers of Sperm and Blue whales still pass close by the shore on their way south to Antarctic breeding grounds. Sadly, we were too early in the season to see any – though it was galling to find out that as we drove back on the inland route, whales were being sighted in Sydney, off Bondi Beach!! Here’s a shot taken near Eden, trying to pretend it is a cliff, rather than a 2 foot riverbank!! It could be a lunar landscape, almost! 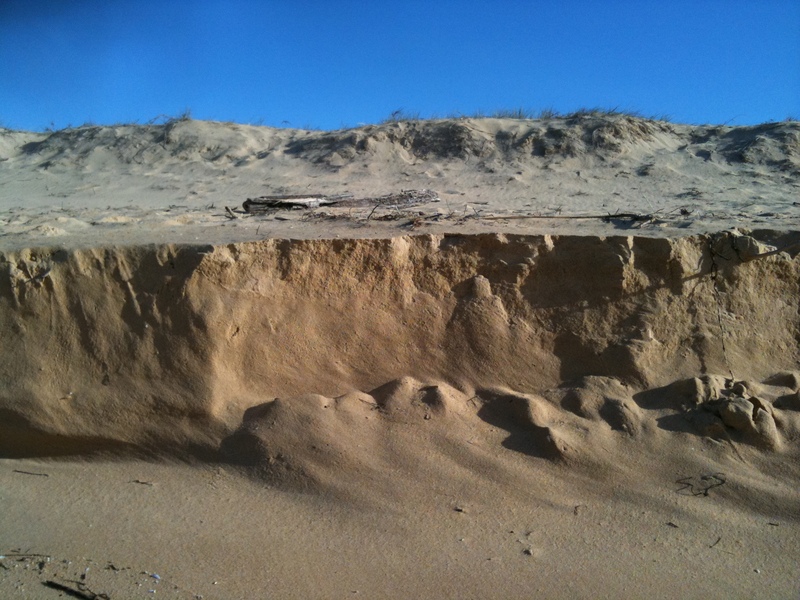 Did you ever see such a think sandy riverbank; just where the River runs into the sea near Eden. 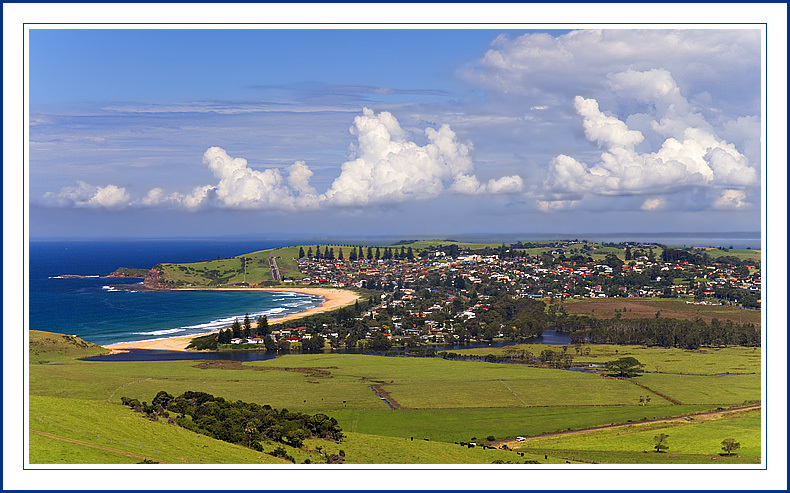 I took the train up from Sydney to my current location – on the map above passing through Tweed Heads and into Queensland….. that part of the journey is 11 hours by train. 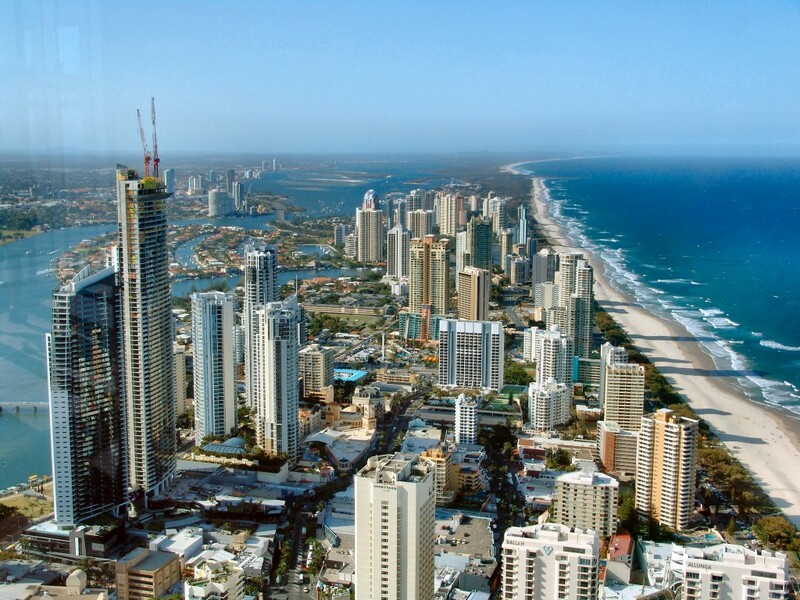 The coastal track stops just into Queensland and the last 3 hours to Surfers Paradise are by coach! A further 1.5 hours would get you to Brisbane. There WAS a rail track onwards to Brisbane along the sea, but a lack of passengers and poor maintenance of rolling stock, track and stations meant it was closed 2o years ago! As one Rail employee said to me : 1100 Km or track is a lot to maintain. For the geographically-challenged amongst my readers, that’s the distance more or less, from Lands End to Jon O’Groats!! Though with different trees and, of course, no Guinness – or diddly-diddly-dee tourism!! Sheep-farming (shearing comes later) or cattle farm visits; Sailing in and around Sydney Harbour from 2 different people; Beach houses / millionaire’s country retreats / bush cabins; Cars on loan; Lunches / Dinners in very exclusive venues in Sydney and beyond; Bike riding in the Blue Mountains; Dog walking all over the place – everyone seems to have dogs!! Not to mention the wonderful vistas and the sheer fun or travelling long distances with no particular rush to get anywhere……. if I go much slower as I adventure along, I shall probably stop completely. Joan, Joan, where are you…………………………………………??? This entry was posted in Australia, Outback & Bush, Travel. Bookmark the permalink.